You Wanted The Best — You Got… a facsimile thereof. Did Paul Stanley name the first and only KISS Reunion album in honor of his wackadoodle bandmates, Peter Criss and Ace Frehley? Psycho Circus followed on the heels of The Reunion Tour 1996, which was touted as The Return of KISS. But KISS never went away. (It should have been called “The Reunion Of The Original Members Tour” – but how do you print that on a ticket and stay fashionable?) 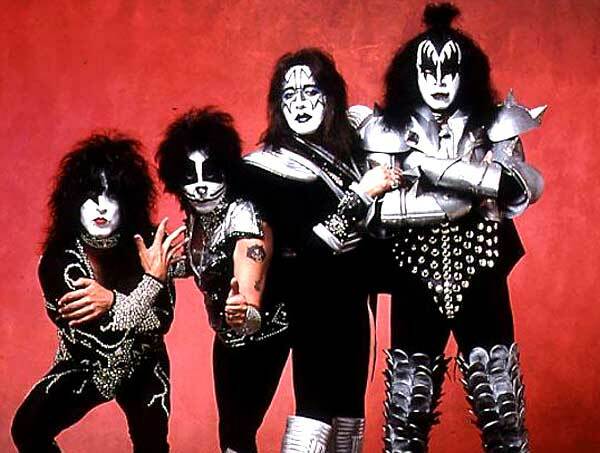 What was regarded as “the return” by only diehard purists (and people who hadn’t followed KISS’s post-makeup career), was actually The Regression of KISS – from a fully-functioning, four-wheeled juggernaut (Paul Stanley, Gene Simmons, Bruce Kulick and Eric Singer) to a dysfunctional pushcart with two of its wheels rolling smoothly and the other two crooked and squeaking and constantly falling off their axles. After the success of KISS: MTV Unplugged in August 1995, where past KISS members Criss and Frehley joined the current KISS lineup to jam on some KISS oldies, “Reunion” fervor had reached a peak. Entrepreneurs Simmons and Stanley saw the glut of money that could be made – and the 1996-1997 Reunion Tour aka KISS Alive Worldwide would be the most successful KISS tour to that date. Touring spawns talk of a new album. KISS (i.e. Simmons and Stanley) saw more dollar signs, more product. That resulted in the psycho circus that would become Psycho Circus. Y’see, Peter and Ace, tasting relevancy by being included in the KISS machine once more, instead of being thankful they had been pulled from obscurity (Peter especially! ), had long since reverted back to their idiot selves, allowing lawyers, girlfriends and card-playing buddies to sway them to whatever worked worst. Nothing went smoothly with the recording process. Both Criss and Frehley were only used sparingly on the album, for various reasons (deadlines to be met, lack of ability, tardiness, erratic behavior, lawyers interceding), and many session players were hired to complete their parts… YET… Psycho Circus (either despite its adversity or because of it), is one solid KISS mamajama. Produced by Bruce Fairbairn, Psycho Circus does in fact capture some of the KISS magic of old – but not because the original lineup is (supposedly) performing on it. It’s because Paul Stanley and Gene Simmons were still in the zone of writing excellent hard rock material (coming off Revenge 1992 and Carnival Of Souls 1995), and the session players they used (notably, drummer Kevin Valentine and lead guitarist Tommy Thayer) did such remarkable jobs. Circus hums with a vitality and energy on par with the best KISS material from the 70s and 80s. With a few juvie elements thrown in. Psycho Circus. “…the makeup runnin’ down my face / We’re exiled from the human race…” I love that line and its context and innuendo. Paul Stanley’s voice in fine form, belting the opener to the album. Within. A Gene Simmons scowler, using both high and low registers of his voice, at one point, overdubbing both ranges simultaneously in two separate, eerie vocal passages! Song even switches to a surprising 6/8 passage midway. Opening backwards-guitar passage by Bruce Kulick (leftovers from Carnival). Into The Void (not to be confused with the Black Sabbath song of the same name) is a Frehley song that somehow sounds like one of his solo efforts; one of the few tracks he plays lead guitar on. Tommy Thayer (ex-Black and Blue guitarist, now KISS gopher, making his presence felt as tour manager, videographer, editor, and Frehley’s guitar tutor for his own songs!) did all the lead work that Frehley did not have songwriting credits on. We Are One. This nostalgic Simmons track always brings me to tears. WHY? Simmons opts for his human AOR voice (the same one he used on The Elder), rather than his demon growl, and I think that’s a crybaby factor for me. Because it reminds me that one day this is the ONLY voice Simmons will be able to use, when we’re all too old for this game and gaze longingly back, with this song in the background… “Everywhere I go, everyone I see / And I see my face looking back at me…” That makes me cry, because of the gigantic legacy Simmons has created. He looks out at a sea of faces, and his creation, his persona looks back at him through the makeup on hundreds of faces. What must that be like?! To BE Gene Simmons or Paul Stanley. “What I know is true/ Every one of us lives inside of you…” It IS true. KISS lives in each one of us, yes, even those unfortunate few who are NOT KISS fans, because their influence has affected others around you all around the world in myriad indescribable, inexplicable ways. You know that one in four people in Australia owns at least one KISS album? Influence like that is dangerously close to godlike. A butterfly flaps its wings in China — hurricanes in Nebraska. A KISS record is burned in Ohio — a stadium is sold out in Chile. Raise Your Glasses. Another superbly-constructed song by the master songwriter, Stanley. “I shot my arrow at the mark / And hit it.” Nice to hear a retrospective that isn’t moaning about loss or soul-searching, but celebrating unbridled success, with a snappy Ace-like solo by Tommy Thayer. An awesome look back at his own career: “We struck our matches / Set the world on fire,” yet the lyrics must have given Stanley pause when considering his two re-recruited bandmates didn’t deserve all the accolades he was showering upon his band; some accolades, yes, but not everything that he and his brother-in-arms (“Went into battle with a force of thunder”) had to live through to that moment. I Finally Found My Way …to Alice Cooper’s How You Gonna See Me Now. Written by Stanley and Bob Ezrin, this classically structured, piano-based ballad (sung by Criss), sounds at first like something off the good Peter Criss solo record (the 1978 one he made while still nominally in KISS), until we realize it sounds like Alice – because of Ezrin! Ezrin didn’t write How You Gonna See Me Now? but he worked so extensively with Cooper in his heyday that he unwittingly put that stamp on this song. Criss would complain that he hardly played on anything. Fact is, he played on nothing except Into The Void. Because he was a furball of his former self. Stanley would write in his autobiography years later that Criss could hardly hold his sticks. Drummer Kevin Valentine’s original interaction with KISS was hiring and operating the P.A. for KISS Conventions. A veteran of Donnie Iris, Graham Bonnet, Cinderella, et al, on Eric Singer’s referral, Valentine was hired as drum tutor for Peter Criss for the Reunion Tour. [Scene Missing] Next stop: ghost player on Psycho Circus. Speaking of Alice Cooper: Cooper’s lawyers sued Paul Stanley and Bruce Kulick for Dreamin’, which sounded too close to I’m Eighteen for comfort. It was settled out of court. Journey of 1,000 Years closes the album, a thoughtful, introspective Simmons chugger that develops into something quite epic, with a string passage that emulates the guitar solo from the opening track, nicely book-ending the album and making this song sound nostalgic – when, in fact, you were experiencing deja vu because you had just heard that motif at the head of the album! – with Simmons’s voice rising in intensity as it progresses to a climax, and fades into an uncertain future. 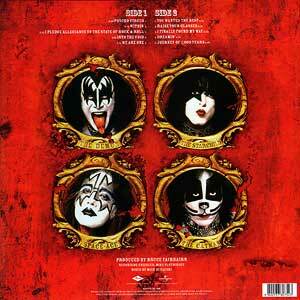 The CD was released with a lenticular cover that showed alternating images of an evil clown dominating the band’s faces, and the KISS logo. 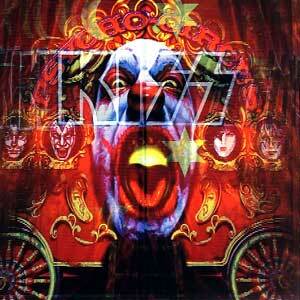 Like the cover, Psycho Circus was a façade. It sounded cohesive, and actually does achieve greatness in parts, but it was a fragmentary offering from a COMPANY, not a band. But we can understand why it was sold as a band renewed. The public wanted that reality so much that they MADE it reality in their heads, ACTUAL reality be damned! Curtis Cuomo, Holly Knight, Karl Cochran, Bob Ezrin. by Jon Dunmore © 27 Oct 2015. Created for 3D, which is why there are so many outward thrusts of guitars, instead of crotches. Harmony guitar solo is edited down -annoying.